FX Math Assistant comes with the unique feature to work directly with self defined functions. Its numeric analysis engine isn't limited to a standard set of functions. Further features are Sum and Product iterations and a combinatorics assistant, making this a very valuable app for phones and tablets. 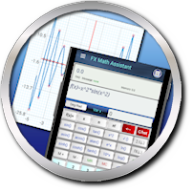 FX Math assistant provides an integrated documentation and allows sending feedback or calculation results by turning content into emails. Its numeric calculation engine is based on fx-Calc technology with a huge worldwide user community. Easy and intuitive handling turns this application quickly into your mobile Swiss knife for calculations - simply by enabling the processor power of Smart-phones and Tablets.